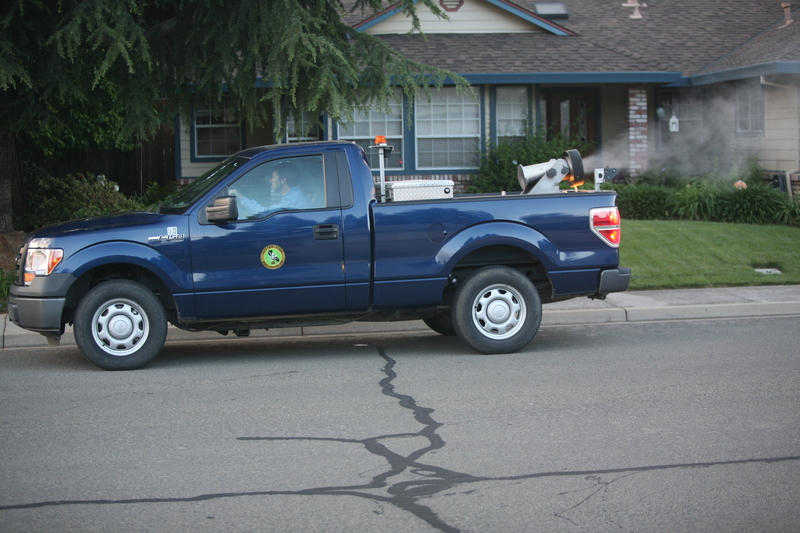 The risk of contracting West Nile Virus may become significant again in Yuba and Sutter Counties this season. As a result the District plans to aggressively combat mosquitoes that carry the virus. By reducing the numbers of mosquitoes, the chances of a mosquito bite will diminish. More importantly, when disease is present, the chances for transmission are lowered. Fogging is performed during a temperature inversion. In the summer months, temperature inversions typically occur at dawn and dusk. ​Fogging at dusk will better target the mosquito capable of transmitting the West Nile Virus. When the possibility for public exposure increases, as in town fogging, only the safest materials are considered for use. The District takes advantage of the local newspaper, direct mail, radio stations and the internet to make residents aware of when spray operations will begin. Fogging routes will begin at dusk and continue as late as 11 P.M. on Thursday evenings in Meridian, Robbins, Olivehurst, Linda, Arboga, Plumas Lake, Wheatland, East Marysville, Live Oak, Tierra Buena, Yuba City (Hillcrest area) and Sutter. Additional town areas and nights may be added if mosquito-borne disease activity becomes elevated. Interested persons can keep abreast of spray operations by signing up for the District's spray notification email service and by visiting the District website or Facebook page throughout the mosquito season. Although the materials used by the District are labeled and registered for use in recreational and residential areas, sensitive persons are encouraged to avoid sprays by staying indoors, turning off evaporative coolers and by keeping doors and windows closed during shese hours. This program begins as trapping data indicates a rise in our mosquito population but typically starts in late June and continues through July, August and September. We would be happy to answer any questions or concerns you may have about this program. Please contact our office Monday thru Friday between the hours of 7 AM and 3:30 PM. For additional information about pesticide safety in residential environments, check the CDC's page on pesticides used for mosquito control.